Yep, it's true. I did that. I couldn't quite settle on the exact theme for our theme day so it was a Flower/Mud/Growing Things Day. I'm finding it quite difficult to get outdoors for any length of time between everyone's varying nap, diaper changes, and feeding schedules. So we brought the fun indoors to us and kids of all ages got to play. 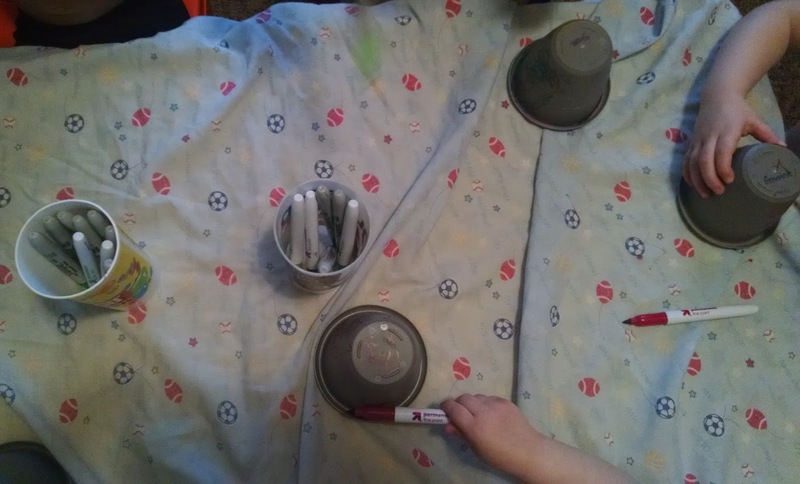 We began our day coloring small flower pots (found at Dollar Tree) with Sharpie markers and then planting Cosmos and Marigolds. The kids painting their flower petals beautifully with Crayola Neon paints. Then for the fun part of the day: the dirt table. I filled the water table with dirt, scoops, fake flowers (found at Dollar Tree), and pots and pans. Most of the kids loved it, only a few were worried about getting their hands "icky yuck." 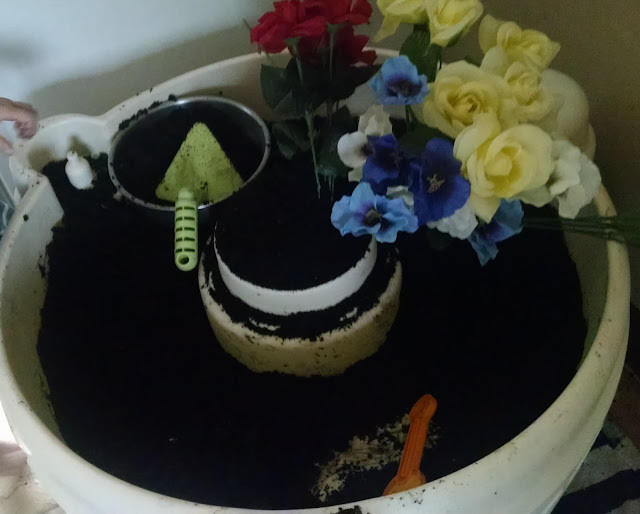 They made "cakes" with the dirt, planted a "garden" and made it "snow dirt." 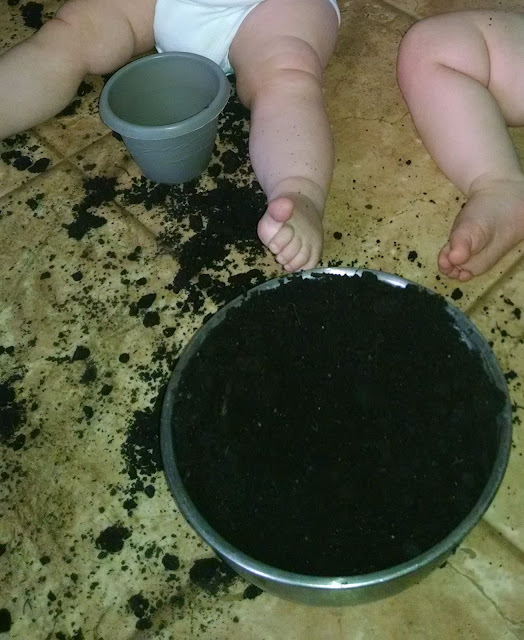 I love that all ages got to play in the dirt; even the babies got to experiment. The afternoon treat to go along with our theme for the day: Dirt Cups (chocolate pudding, chopped up Oreo's, and a gummy worm on top). 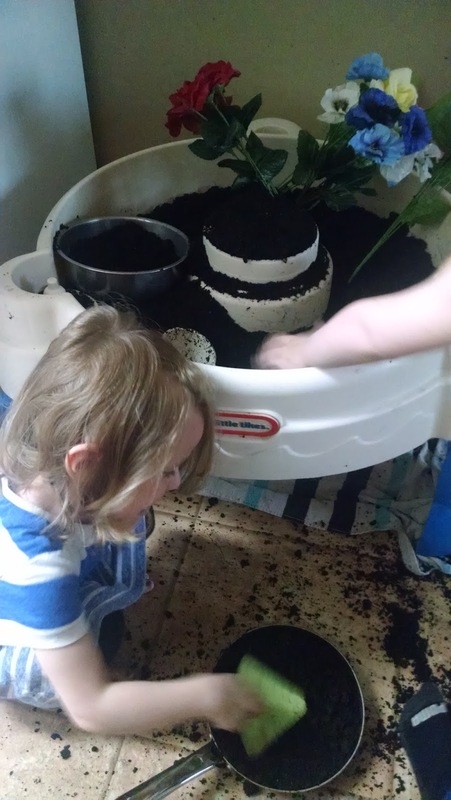 Yes this day would have been just as much fun outdoors and less messy too (although our Makin' Mud Pies activity required the entire backyard to be hosed down) but the kids had fun with it regardless of the fact that the dirt was in our kitchen. I was surprised this didn't take too long to clean up. Scrubbing the water table clean was the longest part of clean up. If you're experiencing rainy or cold weather this spring, don't hesitate to bring the fun inside. 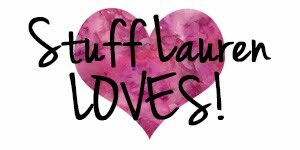 There's just as many learning opportunities and it's just as much fun.